The Nocturn uses Novation's sophisticated Automap technology to give you integrated, hands-on control of your software - and all for an almost unbelievably low price. Originally announced at the winter NAMM show, but only beginning to hit the stores in the last couple of months, Novation's Nocturn has been one of the most hotly anticipated releases of the year. The Nocturn's primary purpose in life is to give hands-on control of plug-ins with the minimum of fuss and setup. It is also capable of acting as a MIDI controller for other aspects of your DAW, and even hardware instruments and devices. Like the previous Automap-powered devices (the Remote SL and SL Compact series), the Nocturn hooks into the automation frameworks used by Audio Units, VST, RTAS, and TDM plug-ins. This means that the controller can instantly grab a list of all the controllable parameters in a plug-in and assign them to its knobs and buttons. The controller stays in sync with the plug-in bi-directionally, updating with changes made on-screen by the mouse, automation, or patch changes. The Nocturn controller is petite, but the controls feel surprisingly spacious due to the unusual way in which they are arranged. This clever design means that nothing obstructs your thumb when controlling the back row of knobs. There are eight primary knobs, all of which are touch-sensitive continuous controllers — an essential feature for a successful controller, in my view. A ring of LEDs around each encoder shows the current value of the controlled parameter. In the centre is the ingenious Speed Dial knob (see the 'Speed Dial' box) and a touch-sensitive crossfader. Like the knobs, the crossfader has a bit of lateral wobble, but, not for the last time, I draw your attention to the fact that this unit costs £70. I said £70! Along the bottom of the control panel are two rows of eight buttons. The top eight are freely assignable to on-screen controls, while the bottom row are used for Automap functions, such as banking between parameter pages and switching between plug-in instances. All of the buttons light up brightly to indicate their on/off status. The only connection on the controller is a USB port, which provides power and all communication with the host computer. All the clever work is done behind the scenes by the Automap 2.0 software, and the Nocturn cannot be used as a stand-alone controller. The USB connection is on the side of the box, which I originally thought was going to be untidy, but it's actually quite unobtrusive, and means that the controller can sit flush with a laptop, display or keyboard that's directly behind it. In my studio, the Nocturn perched neatly on top of my controller keyboard, aided by the fact that it sits on large rubber pads rather than feet. 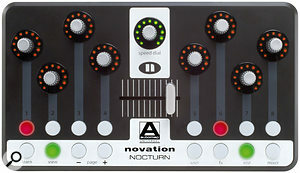 Although Automap's main approach is to talk directly to plug-ins, the Nocturn can also be used like a traditional MIDI controller. This mode retains much of the main functionality, but without the ability to Automap and read parameter names. Also, unless the client has some kind of intelligent MIDI control scheme (such as Reason's Remote), MIDI assignments will be fixed to specific tracks or plug-in instances rather than fluidly moving from one virtual device to the next. Activating any of the virtual MIDI channels in Automap Server sets up a new MIDI controller bank. Every MIDI CC channel is pre-mapped across several pages, ready for you to assign to controls using whatever MIDI learn functions your software offers. Alternatively, you can freely set any knob or button to a specific CC number to control devices with fixed CC assignments. Communication is bi-directional if the software supports it, and the HUD, LED rings, and button lights all respond to changes in the software, and update instantly on page changes. This is seriously awesome, and it's the unit's secondary function! The Nocturn (like its bigger SL siblings) requires that an intermediary application called Automap Server be running at the same time as your DAW. As well as providing all the necessary configuration options, the Server supplies a floating HUD (Heads Up Display) window that shows you exactly what the controller is doing. This is essential, as the Nocturn lacks any displays for indicating what its controls are mapped to. The HUD can be moved and resized freely, and set to one of three transparency levels. 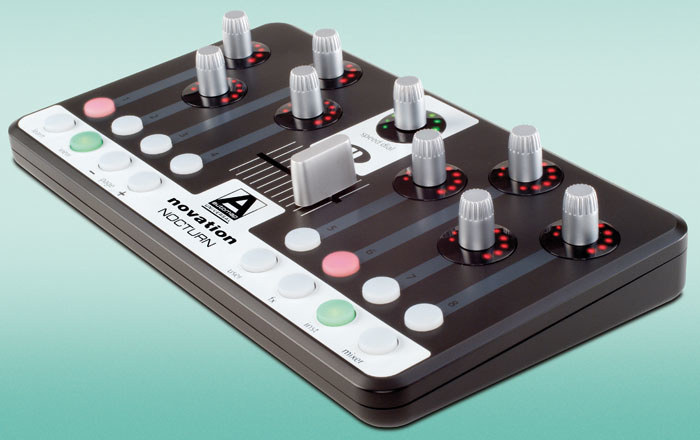 The Nocturn boasts eight touch-sensitive continuous controllers and eight freely assignable buttons, along with the ingenious 'Speed Dial' knob and a touch-sensitive crossfader. The buttons along the bottom are used for Automap functions.Another prerequisite for using the Nocturn is that you prepare your plug-ins for sync'ing with Automap. Any plug-ins you wish to control must be 'wrapped', using the Plug-in Manager page in the Automap Server. This simple procedure creates Automap-ready versions of your plug-ins, which should be inserted in your DAW's mixer instead of the originals. In Live, both versions were visible in the plug-in list, but in Pro Tools only the Automap versions appeared, which made for a much tidier list. Open an Automap-wrapped plug-in in your DAW and Nocturn jumps into life as its controls snap to the plug-in's parameters. The HUD is brought up with a tap of the Nocturn's View button. 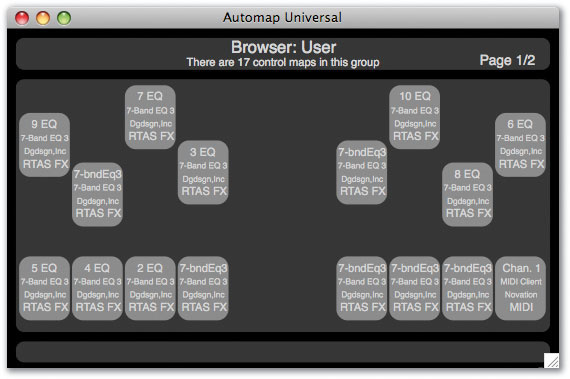 The way in which parameters are mapped depends on whether there is a factory default map or a user map for the plug-in. With no default map, parameters are just blindly mapped to sequential knobs and buttons in the order in which they appear in the automation list. This generally results in a chaotic map, with little intelligent grouping. Half the parameters are mapped to the buttons, and Automap has no way to tell if this is appropriate, so these controls are mostly unusable. Sometimes you get lucky, with the help of some foresight from the plug-in manufacturer. NI's Massive, for example, lists its eight Macro controls first, so they appear on the Nocturn's knobs. Unless you are in Pro Tools, that is, which adds Master Bypass to the top of the parameter list. The Nocturn's HUD (Heads Up Display) window, right, gives you a quick overview of which parameters the controls are assigned to; in this case, D16's Phoscyon 303 emulation. The bar along the bottom of the plug-in screen appears in all Automap wrapped plug-ins.Having somewhat bought into the hype that the Nocturn would give me instant results, I was disappointed with the jumble of controls presented to me for plug-ins with no preset mapping. However, a later software update added more pre-mapped plug-ins, and I soon came to terms with the fact that the mapping really needs some human input for decent results. The fact is, any time spent creating your own maps is repaid in spades. Even when a factory default was available, I found that I wanted to make my own layout, and I enjoyed spending a few minutes honing my mappings to perfection. And that's as long as it takes, because the manual mapping system is fast and simple. To assign a plug-in parameter to the Nocturn, you just press the Learn button, click an on-screen control, then touch a knob or press a button on the controller. A Learn Latch mode allows you to assign multiple controls in quick succession, although it's rather easy to mess up your map in this mode and write over a bunch of your controls with the same parameter. An alternative assignment method is to click on a control in the HUD, then choose a plug-in parameter from a pop-up list. Once assignments are made, you can customise their behaviour with the Range and Step Size settings. For knobs, these settings affect the sensitivity of control, with the ratio of range to step-size determining how far you need to turn the encoder for a given result. The baseline is a 0-127 range with steps of one, giving something like a natural one-to-one mapping. Sensitivity is also varied with a user-tweakable encoder acceleration system, so that you get finer control when you move a knob more slowly. The Range and Step settings work really nicely with buttons. A range of zero to one, with a step size of one, results in a typical on/off toggle. However, set a higher range and the buttons can step through several values in sequence. For example, the Sonnox Oxford EQ has a button on its high-pass filter that cycles through slope settings from 6dB to 36dB. Although a knob might suffice, I set up a faithful recreation by assigning a button with a range of one to six and a step size of one. I've been looking for a controller that can do this with buttons for a long time. Controls can be reversed by swapping the Min and Max values for the range. I used this to 'fix' the Oxford EQ's Q controls, which have always worked in the opposite way to what I'm used to. A step size of zero makes buttons operate in 'momentary' mode, in which they are only active while held down. These methods for fine-tuning controls get the job done with just three numeric fields, but are rather esoteric. Dedicated 'momentary' and 'reverse polarity' check boxes, and a 'sensitivity' control for knobs would be much easier to understand without needing to hit the manual. Host-specific plug-ins, such as Logic's instruments and effects, present a problem for the Nocturn, and any other controllers that rely on the automation system in open formats like VST and AU. Sub-hosts like NI's Kore are similarly snookered by these plug-ins. However, the Nocturn can at least fall back on its MIDI controller mode, and allow you to map controls to the built-in plug-ins in Logic, Live and so on. 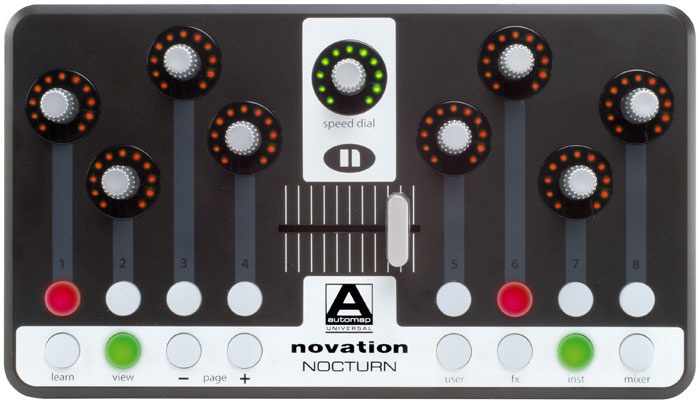 Live and Reason have their own remote control technologies with the potential to get great results with the Nocturn using only a simple MIDI map. However, neither directly supports the unit yet, so it's a matter of hoping that someone, pro or amateur, will come up with the necessary controller 'personality' files. Once you've perfected a custom map, or tweaked a factory preset or Automap, you can set it as the default so that it will load every time you use that plug-in in the future. After a bit of time using the surface instead of the mouse, you won't look back. The HUD means that you can forget about the original plug-in GUI to a certain extent. Some plug-ins lend themselves to Nocturn control more than others. Compressors and simple effects are great because all their controls tend to fit on one page. EQs work well too, as their controls group naturally onto the Nocturn's unusual two-by-four diamond formations of knobs. Banking between multiple pages is achieved with two dedicated buttons. The HUD helps you stay oriented, although a bonus would be the ability to name pages. Pressing one of the Nocturn's group buttons (in this case 'User') causes the HUD to display a list of currently open plug-ins laid out in the format of the Nocturn's controls. Touching a control focuses the Nocturn on the corresponding plug-in. Neat!I had great results using the Nocturn in Ableton Live, but I was particularly impressed by the controller's integration with Pro Tools. Supporting Digidesign's own plug-in formats, RTAS and TDM, means that Automap can be used with the factory plug-ins, as well as Pro Tools-only instruments such as Xpand, Hybrid and Transfusor. 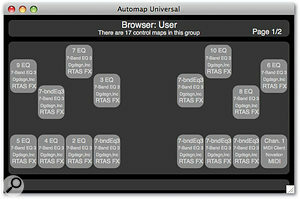 Ready-made maps are supplied for most of the standard Pro Tools plug-in suite. Some of the mapping choices are questionable (why put all EQ gains on one page, then all frequency controls, on another, Q on another, instead of grouping by bands? ), but are a bloody good effort. Unlike in Live, older Pro Tools projects that predated the Nocturn opened up using all the Automap plug-ins. By default, the Nocturn actively follows whichever plug-in is focused upon in your DAW. This behaviour can be switched off with a menu command in Automap Server, although a Lock button would have been neater for keeping a particular plug-in tied to the controller. Four of Nocturn's buttons are dedicated to browsing open plug-in instances in the Automap HUD, making it possible to call up any plug-in instance from the controller. Plug-ins and MIDI maps are divided into three categories: 'User', 'FX' and 'Inst'. A fourth group, 'Mixer', holds mixer control banks, where supported. Pressing one of the group buttons brings up a list of plug-ins in the project, laid out like the Nocturn's controls. Touching or pressing a control brings up the corresponding plug-in. This is a lovely solution, and works well when there are just a handful of plug-ins. It's not so successful if you have a large number of, say, EQs, all called the same thing. You can rename each instance in the plug-in GUI, but it's tricky — because the plug-ins are not laid out in track order, they change position in the list based on which was most recently opened. The vast majority of VST, AU, RTAS and TDM plug-ins will work smoothly with Automap 2.0 and the Nocturn. However, I encountered a couple of situations that can cause unexpected results. 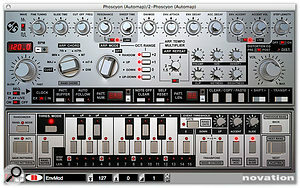 The first was with Native Instruments' Kontakt and Battery. Due to the modular nature of these instruments, parameters are not hard-wired to automation nodes, and the user must assign controls to an automation list manually. Although Nocturn picked up this list, control only worked for some parameters in Battery, and not at all in Kontakt. The other slight issue is with plug-ins that have resizable windows. Wrapped plug-ins have an Automap control strip added to the bottom of their window. When you resize the window, this does not get moved properly and may disappear. Closing and opening the window forces a redraw and the problem goes away. Possibly related was the problem I had in Reaktor, in which the control strip was always placed about three quarters of the way down the window, making all controls below this point inaccessible. 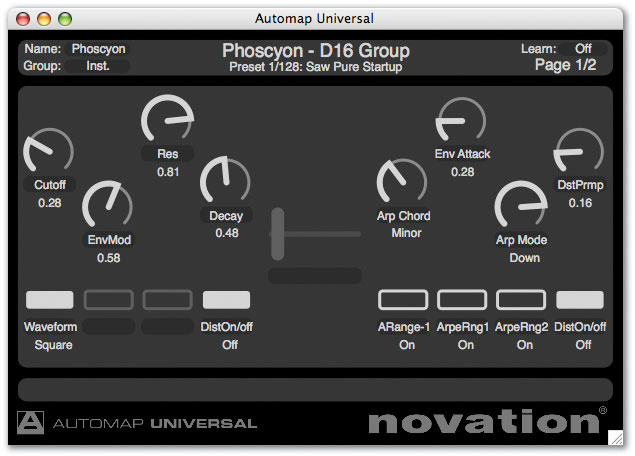 Quite a few plug-ins have enhanced support in the shape of factory maps, and this list will undoubtedly grow. I'm pretty confident that Novation are going to shift a lot of Nocturns, and I look forward to the user base sharing maps for plug-ins, remote files and MIDI maps for the likes of Reason and Live. As well as controlling plug-ins, support is provided for controlling the mixer in a limited number of DAWs: Sonar, Tracktion, Cubase and Nuendo. If your host is not supported yet, you can still use the MIDI mode to map knobs directly to controls (see the 'General MIDI' box). The Nocturn and I didn't hit it off straight away. It took me a while to get used to the Heads Up Display, and I wasn't convinced by the random control maps produced by Automap when no preset existed. However, once I started setting up my own layouts with the learn function, automatically picking up each control complete with its name, value and data type in a single touch, I was hooked. The Nocturn adds a really enjoyable tactile dimension to a computer-based setup. One evening after I began to click with the Nocturn, I mapped out D16's 303 clone Phoscyon and started mucking about with the controls. The next thing I knew, I looked up and two hours of blissful acid knob-twiddling had passed. Novation have really gone the extra mile with Automap 2.0. Support for RTAS, and, in particular, Pro Tools HD's TDM plug-in format are surprising, and very welcome. There's an obvious attention to detail that makes the price tag even more impressive. I find the main question when it comes to controllers is, 'yeah, but will I actually use it?'. I've been through a lot of controllers, most of which end up gathering dust because there's always some flaw or barrier that means I fall back to using the mouse. This time though, I think Novation have come up with something that will see regular day-to-day use for many effects plug-ins, and quite a few instruments. Even if you only ever used it to control your favourite EQ, it'd be well worth the money. Get your hands on one. Other than Novation's larger Automap contollers, the two alternatives that come to mind are Behringer's BCR2000 and Native Instrument's Kore 2. The BCR2000 is in the same price range and has many more knobs, plus MIDI connections and stand-alone capability. However, it's a traditional MIDI controller, so lacks the sophisticated advantages that come with Automap 2.0 and the HUD. There are interesting comparisons and contrasts with Kore 2, which provides a similar level of control over plug-ins. It is significantly more expensive, but the extra money buys you better build quality, on-board displays, and a suite of included effects and synths. Kore also offers the extra dimension of multiple plug-in hosting, and tends to be used more as a sound platform than an effects controller. Despite these extra strings to its bow, as an effects controller Kore lacks Nocturn's immediacy and ease of use, and results in all your DAW's inserts reading 'Kore'. There's an interesting halfway house option, because I discovered that the Nocturn makes a wicked controller for the free KorePlayer software. Automap and general-purpose MIDI mode not enough control for you? Well, one extra trick up the Nocturn's sleeve is the Speed Dial knob, situated in the centre at the top of the unit. The knob also operates as a button, which, when pressed, puts the knob into Patch Selection mode. Turning the knob spins through the presets on any focused VST plug-in. A second mode, Speed Dial, lets you adjust just about any control on screen without any mapping or setup procedure. Simply hover the mouse cursor over any knob or fader, and the Speed Dial can take control of it. As soon as you touch the Dial, the knob takes control. You then let go to release the control. Amazingly, this works for anything on screen, not just plug-ins. In fact Speed Dial has the same effects as clicking with the mouse and dragging diagonally up to the right or down to the left, cleverly taking care of vertical or horizontal sliders as well as knobs. I was very excited about this idea when the first promo videos appeared, and it works. To be honest, it's not quite as useful as on-screen knobs that support mouse scroll-wheel control, but it's much better than adjusting knobs with a laptop's trackpad. 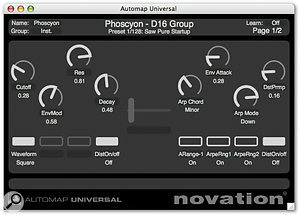 Aware of all plug-in parameter, names and values. Knobs are a little bit wobbly. A highly usable and customisable control pad for your plug-ins, at an irresistible price point.